Need advice from a nurse? Our highly trained nursing staff is available to answer your questions and concerns 24 hours a day. Each day our nurses provide advice on a wide range of topics from fevers, respiratory problems, to medication dosing. During business hours, our experienced in house nurses will be answering your concerns. Each of our LPNs and RNs take turns providing advice. Cindy in Cary, Tina in Apex, and Jennifer in Fuquay-Varina are some of our most experienced nurses providing triage with 82 years of combined experience!. After hours, we have contracted with WakeMed to provide nurse advice. We are excited to have partnered with Kids in Parks and Walk with a Doc starting in the Summer of 2017. Kids in Parks is an exciting organization that has created a network of trails throughout the area with self-guided brochures that teach kids about nature while being outside. The Walk with a Doc organization works with local doctors to encourage behavior change and healthy living by connecting the physician with their patients outside of the office. The support of these organizations is amazing. Every few months we organize to have several of our doctors, nurse practitioners, nurses, and administrative staff come together for a hike. We invite our patients an their families to join us. The hikes are so much fun and our families love them. Another great aspect about Kids in Parks is that children earn prizes for tracking their adventures outside! You can sign up on their website http://www.kidsinparks.com. In an ongoing effort to improve the care we give our patients and their families, Cary Pediatrics is engaged in a number of projects to look at our practice. Some of these involve our clinical decision making and following clinical guidelines, and some with patient satisfaction. We are pleased that patients are happy with our practice, and would refer others to see us. But we have heard that our biggest barrier is time waiting in the office to be seen. We have worked with our scheduling staff to ensure that appointments that are made have enough time to discuss the concerns the parents have. We are also working on streamlining the use of our EHR to expedite orders and the gathering of information. We also could use your help: when you call to make an appointment, either a sick visit or a checkup, if you have specific questions or concerns that may require a prolonged visit with your provider, please let us know beforehand, so we can budget time, and be able to give your child as much time as they need, and help keep us on schedule. We also learned that we are doing a good job with having patients with special health care needs see their primary provider, to ensure consistency and continuity of care. But we also see that we can do better. We have highlighted in our scheduling programs and in our EHR a primary provider for patients with special needs. In this way, we should be able to do even better maintaining that important relationship. Below, blue means a patient saw their primary provider. We are proud that all three of our office are performing similarly, showing we are all on the “same page” in our approach to our patients. When you are seeing your provider, you might also hear us mention things like “it is recommended that…” or “guidelines or the American Academy of Pediatrics suggest…” We do our best identifying areas of our practice that have been identified by national agencies as areas of emphasis to improve care, both in the short term and in the long term. Examples in the past year or two include: following industry standards in vision screening in younger children; cholesterol screening in school-aged children; immunizing children, especially those with asthma against influenza; maintaining appropriate appointment schedules for children on chronic medications; tracking newborn screening to ensure complete results; keeping kids on schedule for their yearly checkups. We also try to review the medications that we are prescribing. For example we know that cost is very important to parents when it comes to medical care. We also know that generic medications tend to cost less than brand name medications. Unfortunately prescribing generic medications is not always possible, but we want to keep the percentage of generic medications as high as possible while prescribing the best and most effective medications for the patients. 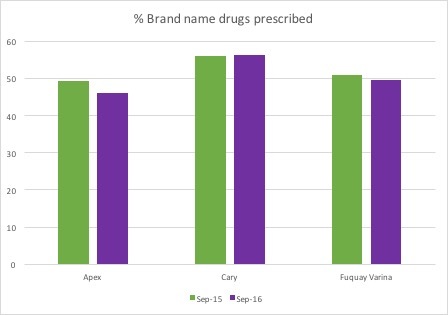 Below is the percent of brand name medications we have prescribed for the month of September the past two years. We strive to continuously improve our practice by reviewing current literature and practicing evidence based medicine. The providers meet frequently throughout the year to discuss the latest literature to ensure that we are all practicing up to date medicine. We also actively seek feedback from our patients at regular intervals. Formally, we will send out surveys via email after visits for our patients to give us feedback. Our questions on the surveys will change depending on our goals, but mostly involve making sure you were satisfied with all aspects of your visit from making the appointment, to your time with your nurse, and the time with you spent with the provider. We use this feedback to make changes in our workflow and procedures. Listening to our patients is one of our most important goals, so that we can provide the best care and service to our patients. 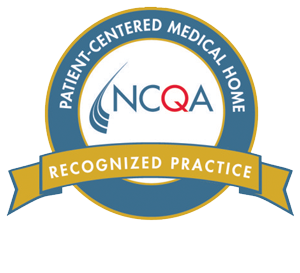 Cary Pediatric Center is proud to announce that in June 2017 it was recognized by the NCQA Patient-Centered Medical Home (PCMH) 2014 Program. What does this mean, and what does it mean for you as our patient? The patient centered medical home (PCMH) is a promising model for transforming the organization and delivery of primary care. It means that you will be surrounded by a dedicated team of health professionals, working together with you, to optimize your health goals using the best evidence-based medicine and resources available for you today. Helping and empowering you to take responsibility for your health and giving you the self-management support that you need to succeed. Learn about your child, your family, life situation, and health goals and preferences. Our team will recall your health history every time you seek care and will suggest treatments that make sense for you. Take care of any short-term illness, long-term chronic disease, and you or your child’s all around well-being. Keep you or your child up-to-date on all vaccines and preventative screening tests. Connect you or your child with other members of your care teams (specialists, health coaches, etc.) and coordinate care with them as you or your child’s health needs change. Be available to you or your child, after hours, for urgent medical needs. Our regular business hours are: Monday through Friday 9 am – 5 pm in all three offices and Saturday 9 am – 12 pm in the Cary office only. Should you require medical care outside of these hours, urgent needs can be directed our nurse triage through WakeMed One Call Nurse Line. They can be reached by calling any of our regular office phone numbers. Notify you of test results in a timely manner. Communicate clearly so that all conditions and options are well-understood. Listen to your questions and feelings. We will respond promptly to you, and your calls, in a way you understand. Help you make the best decisions for your care. Give you information about classes, support groups, or other services that can help you learn more about your condition and stay healthy. Help you understand your insurance options, should you be uninsured – all children deserve equal care to stay healthy, please contact our billing department in the Cary office for more information. Know that you are a full partner with us in your care. When you join our practice, you will provide us with a complete medical history and inform us if you obtained care outside of the practice. Upon your first visit, we will have you complete new patient forms so that we may obtain all previous records you or your child may have. Should you have any questions about this process, please contact the Front Office Supervisor at any of our locations. Come to each visit with updates on medications, dietary supplements, or remedies you are using, and any questions that you may have. Keep scheduled appointments or call to reschedule as early as possible. Scheduled visits cancelled in under 24 hours or “no-shows” will incur a $25.00 fee. Understand your health condition and what you can do to stay as healthy as possible. Work with us to develop and follow a plan that is best for your health, if you have obstacles in fulfilling this plan, please discuss them fully with our staff. Contact us, after hours, only if your issue cannot wait until the next work day. If possible, contact us before going to the emergency room so someone who knows your medical history can care for you. Agree that all health care providers in our healthcare team will receive all information related to your healthcare. Learn about your health insurance coverage either from your insurer, or, if you have additional questions about billing, you can contact our billing department in the Cary office at 919-467-3211. Give us feedback to help us improve our care for you. If dropping off a form, please complete the parent portion of the form prior to bringing to the office. After 5 days, your form will be available in the office and on the portal. At each well visit we will provide you with a handout of important information that is specific to your child’s age and development. You will receive a hard copy with their growth documented in the office but you can also download them here in PDF format. If you or someone you care about is having difficulty adjusting to the changes surrounding motherhood, please reach out during your visit to our office to a provider or nurse, or call for guidance. They can be reached at 919.454.6946 and can found on the web at Moms Supporting Moms. With the flu season just around the corner, we have a few things to keep in mind. First, and most importantly, we recommend that all children 6 months and older receive the flu vaccine. This is the best and most effective way to prevent your children from getting the flu. If you haven’t already, please call one of our offices to schedule a nurse visit to receive the flu vaccine. Bear with us as our supplies of the flu vaccine are changing daily. At this time of year, we receive lots of letters from urgent care clinics in the area stating that a child has been diagnosed with the flu and been given Tamiflu, usually appropriately, but sometimes inappropriately. Tamiflu is ONLY indicated in children 2 weeks and older who have been symptomatic for LESS THAN 48 hours. When given in the first 48 hours of the illness, Tamiflu has been shown to reduce symptoms by only 1-2 days. Therefore, do not expect your child to improve immediately after being given Tamiflu. After 48 hours, there is no evidence that Tamiflu has been shown to be effective and should’t be given unless your child is critically ill from the flu (meaning your child is in the ICU in the hospital). There are only a few, rare, reasons to give Tamiflu to children who have been exposed to influenza. We can explain those situations to you if this case should arise. Just like antibiotics, inappropriate use of Tamiflu can lead to increase in resistance, decreasing the effectiveness of Tamiflu. If you have more questions refer to the CDC web site or call our office.